Health and Fitness Education (HFE) specialise in offering clients flexible high quality courses in the health and fitness sector. 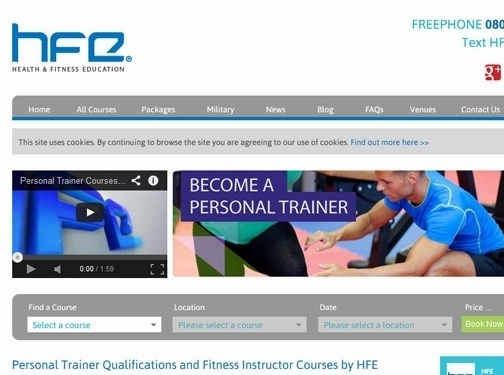 If you have a passion for health, fitness or nutrition and are looking for a career change, a course with HFE could be exactly what you are looking for. With HFE you are guaranteed to find an innovative course that is perfect for you and your chosen career. As one of the UK's leading providers the support offered to clients truly is first class. All of the qualifications and courses are certified through Central YMCA Qualifications (CYQ) and are also fully endorsed by the Register of Exercise Professionals (REPs). With recommendations like that you couldn't be in better hands to begin your new journey within the health and fitness profession. UK (Chorley, Lancashire) based business providing personal trainer qualifications and fitness instructor courses. Website includes details of courses and training provided, accreditations earned, associations belonged to, regularly updated blog (including case studies), terms and conditions, FAQs, pricing, full contact details.